We also have a number of video tutorials which detail certain aspects of Brailie - check out our YouTube playlist here. When uploading your theme with the installer, please ensure you are uploading the theme .zip file, not the entire package you downloaded. In this case, you will be uploading brailieWPtheme.zip. To manually upload your new WordPress theme, login with your credentials to your website and locate the wp-content folder in your WordPress install files. Upload the un-zipped Brailie WordPress Theme folder into the: wp-content/themes folder. Once uploaded, activate the theme by heading to the “Themes” menu in the WordPress Dashboard. Locate the Brailie WordPress Theme theme and hit “Activate”. Please Note - once the demo data is installed, you will several errors accross the pages similar to "Revolution Slider Error: Slider with alias fullscreen-revolution-slider not found." - this is fully expected as Revolution Slider data is imported seperatley, the process for which we will cover below. To remove such errors you need to import the demo slider data, found in your main download package from ThemeForest. To begin head to the Revolution Slider area in your WordPress dashboard. Within this area, click "import" to select one of the demo sliders to begin. Once done, the error will be replaced by a wonderful slider. Although we take the greatest care to make the setup process as simple as possible, in some cases (esspecially on budget hosting where resources and at a bare minimum) you may experience an issue during the automatic setup - this section covers an alternative fallback method you can use should the need arise. The first thing we need to clarify is setting up manually will mean things like widgets and theme options wont be setup for you - this is unavoidable but it will still give you a great base of all the demo pages ready for you to start building your new site. Now you have the pages imported, its time to tackle the images. If you have not already done so, install and activate Attachment Importer and once done, head to Tools > Import and select the newly added Attachment Import from the list of tools to continue. Ok so you now have the pages and images all imported and ready, you now need to simply setup your homepage/blog and menu. To do this head to Settings > Reading to choose your homepage and posts page, and then head to Appearance > Menus to assign the demo menus. Using your Envato username and API details, you can enable automatic updated for your theme (giving you a simple single-click method for updating your theme, similar to a theme hosted on the wordpress.org repository. For details on setting this up, please see the video guide below. Here you can control font settings for your site. Here you can control global settings such as the preloading splash and image protection settings. Here you can control the archive layout for your shopby choosing from one of our awesome layouts. Here you can control the overall header layout you wish to use, as well as setup social profiles, upload your own logo and more. Making changes to the footer/header layout but not seeing the change take effect? - be sure to check your Page Overrides as its likley the page your looking at is overriding the global layout set in the theme options. Here you can control the archive layout for your blog by choosing from one of our awesome layouts. You can also specify your own custom archive title and set your own background image for this title as you wish. Here you can control the archive layout for your portfolio items by choosing from one of our awesome layouts. You can also specify your own custom archive title and set your own background image for this title as you wish. This is where you can choose your desired footer layout as well as assign your social profile links, and customize your copyright text etc. Brailie comes with two widgetized areas, the blog sidebar (shown to the side of the main post content within single posts) and the footer, which allows a number of columns of custom widget content for whatever you wish. Upload a featured image - any size will work though we recommend 700 x 420px. The images will be automatically applied throughout all the neccessary templates and loops so be sure to pick the best shot to reprasent your work. Here you can control the orientation of your portfolio images by selecting one of the provided layouts - you can also upload your portfolio items via the image upload field provided. Upload a featured image - any size will work though we recommend 900 x 600px. The images will be automatically applied throughout all the neccessary templates and loops so be sure to pick the best shot to reprasent your work. To use WPBakery Page Builder within Portfolio/Ebor Mega menu areas etc, 1st head to WPBakery Page Builder settings in your WP dashboard. Once here, navigate to the Post Type dropdown and switch from Pages Only to Custom - this will then allow you to check each post type you wish to enable WPBakery Page Builder on. To begin adding team profiles to your site head to Team Members > Add New in your WordPress Dashboard. Creating a team memeber profile is very similar to a regular WordPress post, in essense you have the regular content area, a title area (for your members name), a role field and a featured image area (the featured image, much like a regular WP post, used to represent your team memeber item within Team feeds and archive pages/searches etc. We will now detail each area. This is where you you can add your members social profile links. To do this simply fill in the select the social icon you wish to use and enter a relevant profile URL and your all set. To add more, simply click "Add Another Entry" and repeat as you see fit. Upload a featured image - any size will work though we recommend 900 x 600px. The images will be automatically applied throughout all the neccessary templates and loops so be sure to pick the best shot to reprasent your team member. To begin creating your portfolio projects, head to Client > Add New in your WordPress Dashboard. Adding a client logo is incredibly easy. Much like a post you have a title field so you can easily locate your client in you WP admin, a featured image area which is where you upload the clients logo, and a URL field if you wish to have the logo link to another page or site.. Here you can specify a URL for the logo to link to. Upload a featured image - any size will work though be sure to keep all client images at the same size for best results. The images will be automatically applied throughout all the neccessary templates and loops so be sure to pick the best shot to reprasent your work. To begin creating your testimonials, head to Testimonials > Add New in your WordPress Dashboard. Creating testimonials is very straight-forward, much like creating regular WordPress posts. You have a title field for the clients name, a regular content area for your glowing quote, and a role field for displaying the clients role within their company etc. Upload a featured image. The images will be automatically applied throughout all the neccessary templates and loops so be sure to pick the best shot to reprasent your work. Contact Form 7 is our recommended form plugin for WordPress. It is a simple but powerful form creator for WordPress. Here we will show you how to use Contact Form 7 to create and edit a basic form. After Contact Form 7 is installed, you’ll find a new menu item in your WordPress admin area called Contact, here is where your forms and created and edited. From the Contact main screen, you will see your first contact form, its usually a default form called 'Contact Form 1' OR if you have imported the demo data for our theme you may see a few forms that we have made specially for you. When creating and editing forms CF7 uses simple shortcodes (in WordPress these shortcodes are words surrounded by square brackets like “[” and “]”) - these shortcodes are generated via the 'Generate Tag' area (marked in red) and then placed in the form builder area (marked in blue) - you can also add your own HTML to the form for extra control. An important feature within Brailie is the use of the "section" block to house your page content. Sections provide a perfect method to keep you page contents nice and organised, but more crucially within Brailie, sections (together with spcial CSS classes) are used in combination to create an array of uniquely styled areas. Using sections is very simple. To begin, simply select the section block and add it to your page, from there you can add a row, and subequently any content blocks you want. Once you have a section setup, you have a number of ways to apply styling to to. The 1st method would be to give the section one of our Special CSS Classes this is done via the "extra class" field (see below for an example). You can also head to the "design" tab to give your section a background colour of your choice, add your own padding, and much more. gray-wrapper - This class gives your area a light gray background colour, ideal of offsetting against a white section. light-wrapper - This class gives your section a light-white background colour. dark-wrapper - This class gives your dark background, and is ideally paired with the "inverse-text" class. image-wrapper - This class is ideal when you apply a background image to an area/section. Using this class will apply a neat overlay to the image, as well as have the image fix in place, giving a nice parallax effect, and is ideally paired with the "inverse-text" class. inverse-text - When using a dark background image or colour, this class is ideal as it makes the text/content within light in colour. stretch-column - This class makes a column a little wider. text-center - This class centers the text within an element. process-wrapper arrow gutter-50 gutter-md-30 - These classes give each process a little more space, as well as a neat arrow in between each process. process-wrapper line gutter-50 gutter-md-30 - These classes give each process a little more space, as well as a line in between each process. 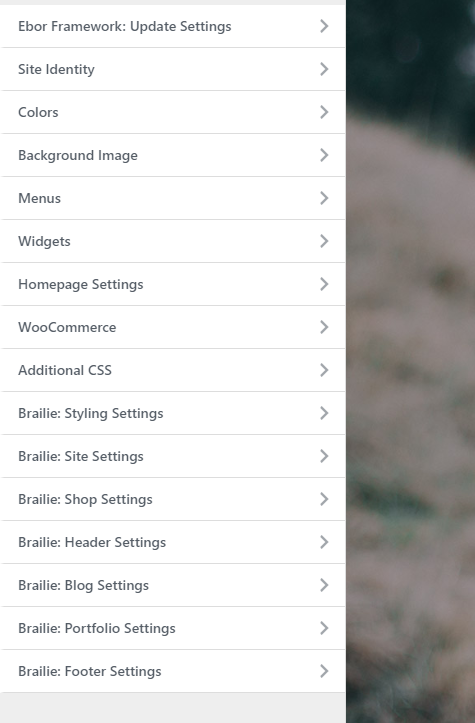 Brailie allows you to override certain elements on a per page basis - these are things such as the header layout (which is ideal if your page has a hero image and you would like a transparent navigation to overlay over it) as well as the footer layout. Creating a boxed layout is simple - simply give your page a background image via the field provided and the page will be transformed - you can also set the background image to either "cover" which will have the image stretch to cover the whole screen OR "repeat" which is ideal if your using a background pattern or such. WordPress offers a really neat method to keep page/post content hidden behind a password, which is ideal for when you wish to have clients view images privatly etc. The process for this is simple - just head to the "Publish" area of your page/post and under "visibility", select the relevant option and enter your desired password. Once done, hit publish/update and your content is now hidden from prying eyes. Brailie WordPress Theme, a TommusRhodus Themes theme.